You don’t get a gold star if you have a natural birth. True, there are no real gold stars awarded when a woman gives birth (and none for parenting either, unfortunately! ), but there are plenty of women who feel empowered and accomplished after achieving a natural birth. This doesn’t mean they look down on those who choose otherwise, or that their world will fall apart if they don’t have that natural birth. It means that they have set a goal that is important to them. A goal that will help them feel strong, capable, and proud of themselves. I was one of these women. I wanted to experience birth in its raw, natural form. I wanted to prove to myself that I was strong. And I’ve never understood why anyone else is allowed to have an opinion on me feeling that way. Shouldn’t the world want mothers to feel awesome about themselves? Risk of stillborn doubles at 41 weeks. In the 1950’s a study concluded that this was true. In spite of the decades worth of new research and information showing that this is not true, and showing that infant mortality rates are literally at their best, doctors continue to use this study to manipulate women into being induced. However, what is often not cited is how inductions triple the likelihood of cesarean birth, and how cesareans increase maternal deaths. Other information not being included in this statement is morbidity outcomes. Obviously not as concerning as mortality, morbidity rates increase for women and for babies when we manipulate labors, giving more flame to the fire of not pushing inductions on women until they have reached their full 42 weeks. I don’t know about you, but I’ll take research done in this century. All that matters is a healthy mom and a healthy baby. Really? So things like informed consent, being treated with respect, and only receiving interventions when medically indicated don’t matter? Try telling that to the woman who took home a healthy baby and an unhealthy case of low self-esteem, postpartum depression, or even worse, PTSD. This lie is so dangerous. It tells women that they don’t matter, which takes away their voice and sets the stage for others to manipulate and even abuse them during their births. We need to strive for every woman and child to not only survive childbirth, but to thrive as well. But to truly thrive, we must include emotional well-being, which requires all those working with birthing women to treat them with the utmost respect and kindness, and realize that health encompasses a lot more than a pulse. There’s no such thing as a perfect birth. So false. I’ve supported over 100 births, and many of them were perfect. We just need to change our definition of perfect. It doesn’t always mean a quickly progressing labor with no interventions. Any birth where the family was treated respectfully, given accurate information, and given appropriate medical care is perfect. Every labor and every birth will unfold differently, and the perfect scenario for one woman won’t be for another. But when care providers only offer evidence based care, and women are treated kindly and given a voice during their births, any birth can be perfect, whether it was an all-natural birth in the wilderness, or had every intervention available in a hospital room. I consider the births of my four children to be perfect. Each birth was completely natural. But I also consider my own birth perfect, and I was born via cesarean. My mom got the care she needed for her situation the same way I did, making each experience perfect. A VBAC has a lot of risks. Yes, VBACs carry a certain amount of risk. HOWEVER, a repeat cesarean carries a lot. So why then do women have to sign a medical consent form to try for a vaginal birth, yet there is NO paperwork to inform them of the many risks of repeat cesarean?! 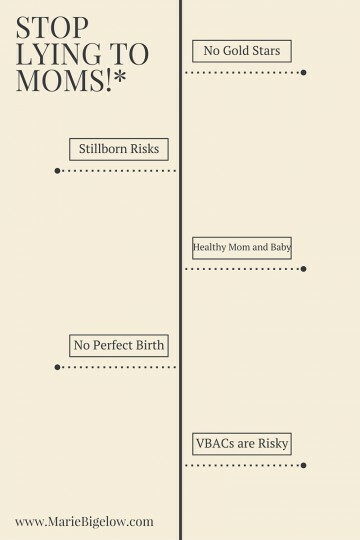 Why are we only discussing the minimal risks of VBAC and not discussing the multiple risks of cesareans? Even though ACOG states that most women can have a successful VBAC, and that providers should not be limiting a woman’s opportunity to try for a vaginal birth, thousands of women are denied this opportunity yearly. To read a lot more about this, I recommend this article. Or you can read Chapter 5 in my book, which is all about cesareans, their risks, and how to lower your likelihood of receiving one. So there you have it! Share this article with your pregnant friends, and let me know what you would add to the list! ← Culture vs. Doctrine, in Mormonism and Childbirth.